Is This New Anime Trolling South Korea and China? 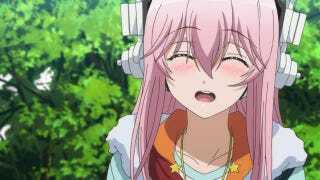 This week, Soni Ani Super Sonico The Animation began broadcasting in Japan. The series features Super Sonico, the mascot character for Tokyo-based game developer Nitroplus. And one short, subtle sequence is raising eyebrows among some online in neighboring South Korea. As you can see, the players' last names read "Yasu" and "Kuni." You know, like "Yasukuni" (靖国), the controversial Shinto shrine for the country's war dead. And maybe their jersey numbers "2" and "3" refer to the Japanese Emperor's December 23rd birthday? Last month, Prime Minister Shinzo Abe visited Yasukuni Shrine, making him the first sitting Japanese Prime Minister in five years to do so. Abe, however, said he renewed the country's pledge never to wage war again. The visit angered Japan's neighbors, and the U.S. Embassy said it would "exacerbate tensions." One Korea site went as far to breakdown the sequence even more, noting that one of the jersey's read "Tomi" and speculated that it referred to former Prime Minister Tomiichi Murayama, who apologized for Japan's war atrocities. And? The site adds that in this sequence, the number four, which can represent death (shi or 死) can be seen in the same frame with "Tomi," as if to wish his demise. That seems to be a stretch, but there you go. Or, you know, maybe this is all a kwinky-dink? Online in Japan, some were amused by the alleged sneaky mention in the anime, while some pointed out that "Yasu" and "Kuni" can be Japanese last names—"Yasu" is fairly common, but "Kuni" is not, however. So maybe online are reading too much into something? Hardly an internet first. Accidental or not, it's probably not a good idea to alienate anime fans anywhere. Still, not everyone was fussed online in South Korea. Some didn't care, and one commenter joked that the names should read "Yaki Niku," which refers to Korean-infused barbecue in Japanese and a favorite dish in Japan.